Behind a pair of homeruns from Jewls Castillo and a solo shot from Lauren Klitenick, the Key West High School softball team completed the sweep over the Vero Beach Indians in dominate fashion winning Saturday’s bout 22-12 in just six innings of play. On Friday night, the Lady Conchs had won 7-6, but Saturday showed that both teams had high power offenses. Key West was down at one point in both games but was able to dig deep and come back twice to sweep. In the top of the first, the Indians jumped out to a 5-0 lead after a sluggish start by the Key West defense. Bottom of the first, the Lady Conchs wouldn’t show any signs of concern as they scored four runs of their own. Castillo sent one flying over the left field fence bringing in Angela Niles and Madison Garcia. The next batter, Klitenick followed up with a homerun of her own putting the Lady Conchs only down one after the first inning. Three unearned runs were scored in the third inning for Vero Beach and the Indians again were leading, this time 8-4. Once again, Key West went to work at the plate. The starting pitcher for the Lady Conchs, Kendell Snow stepped up to the bag with the bases loaded. Snow brought in two runs after a double making the score 8-7, Vero Beach leading. Key West took control of the game in the bottom of the third scoring six more runs. Once again the bases were loaded, Castillo brought in two runs while Klitenick brought in two more and the Lady Conchs led by five, 13-8 over the Indians. After exploding for five runs in the first inning, Vero Beach would only score four more runs the rest of the game. 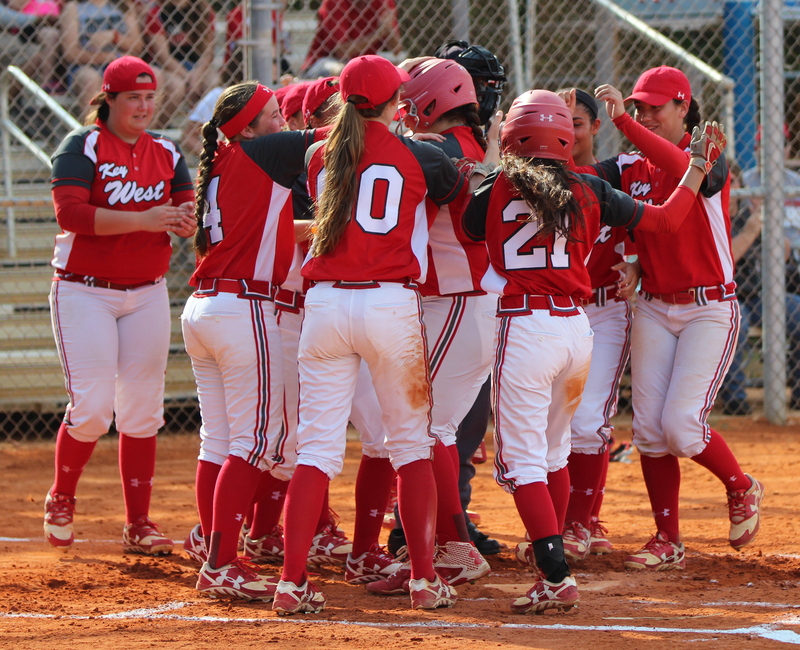 Key West continued to the pound the ball and bring in runs defeating Vero Beach 22-12 in just six innings of play. The Lady Conchs won their third straight game and host Riverdale in a two game series on March 25th and the 26th at the Backyard. This entry was posted in Key West HS Softball.